Carefully selected Arabica beans are the basis for the multilayered aroma of our BellaCrema® range. Through gentle roasting we unlock the mild and light aroma of our Speciale variety which is crowned by a delicate, lightly golden crema. Because of its lower acidity, BellaCrema® Speciale is also the ideal partner for delicious coffee-milk compositions. Because coffee is a product that comes from nature, its taste is dependant on many factors. So that every cup of BellaCrema® coffee tastes the same, we blend several types of coffee beans together. The compostion of the blend is continually adjusted so that we can get the highest quality possible.We use beans harvested in South America and Central America for our Melitta® BellaCrema® blends. Although they are grown under varying conditions, they have at least one thing in common - they are all Arabica beans. 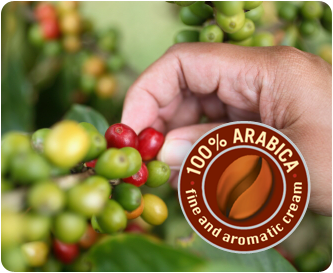 Using only Arabica beans means that we can guarantee a perfect cup of coffee every time. Arabica beans are known for their smooth and mild taste, and are preferred to the Robusta bean with it's stronger, slighty bitter taste. The intensive aroma and the fine hazelnut reddish brown color are also due to the purity of the blend.